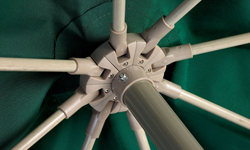 Windmaster market umbrellas are built to better sustain the unpredictable abuses of the wind. Heavy-Duty 1-1/2"Dia. aluminum pole for extra strength. Replaceable fiberglass ribs to bend, but not break! Pulley facilitates easy opening and closing. Extra large vent to release the pressure. 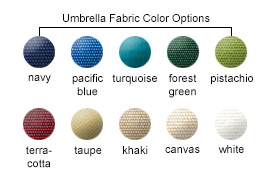 Colorfast, Recacril® marine grade acrylic fabric available in a variety of fabric colors to meet any landscaping scheme. Fade-resistant fabric is solution-dyed meaning that the color is saturated deep into the fabric rather than just on the surface. Optional bar height and beach bottom poles. Versatile pole options include a bar height extension pole which replaces bottom of the standard pole to give it more height to fit bar height patio tables, and a pointed beach bottom pole for use on a soft holding surface such as sand. Bottom pole attachments are easily replaced with a push-button connection mechanism. All umbrellas should be lowered in windy conditions. Operator's discretion is advised to prevent wind direct and consequential damages. Umbrella bases sold separately. Easy to Replace Fiberglass Ribs! Molded anchor bolt holes to secure base to surface. The 2" opening can be adapted to fit 1-1/2" pole using insert tube provided. Long reinforced stem. Thumb screws for easy pole attachment. Molded anchor bolt holes to secure base for extra stability. Thumb screws for easy pole attachment. Optional 35 lb. ring sold separately for extra weight. Designed to be filled with water or sand to achieve 35-40 lb. weight. Thumb screws for easy pole attachment. 84 Lbs. Freestanding Umbrella Base with Wheels. Heavy-Duty rollers for ease of movement. Built in handle for convenient portability. NOT for use with Tables! and Balcony Leg Tables ONLY!